Well, here it is - the inaugral article for my brand new blog. The start of what I hope will be a long and enjoyable foray into the world of Internet journalism (albeit at an exceedingly basic and unpaid level). 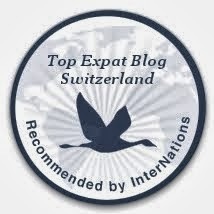 ﻿If you have read the description of my blog or the text in the title header above, then you'll know that I am about to embark on the biggest challenge of my life by moving to live with my new wife, Christelle, in Lausanne, Switzerland. As an Englishman who only speaks a little French (enough to hold up a conversation), it is quite a daunting prospect - and one that is both scary and exciting at the same time. On Saturday 3rd October, I will be leaving the UK to start the long drive from Datchworth (in Hertfordshire) to Lausanne. TomTom, my indispensible travel companion, tells me it should take 12 hours to complete the trip, not counting time spent on the ferry crossing the Channel. Luckily my little electronic buddy won't be my only company for the long journey - Christelle's dad, Bernard, is flying over the day before especially to help me drive. That's incredibly kind of him, but that's just the type of guy he is - I really got lucky with the family I married into, they are all such generous people! 've got the ferry tickets booked, and we'll be leaving at 7am on the Saturday morning. Although TomTom says 12 hours, I'm thinking it'll be more like 15, as my car is a Peugeot 106, which already struggles to get up hills as it is without all the boxes I will be loading it up with to move my belongings to Switzerland. By all logical reasoning that should put our arrival time in Lausanne at "some time in the evening", if we actually make it at all. Luckily I'm a thorough kind of guy when it comes to planning, so I have taken out some European Breakdown Cover, just in case. I'm on countdown mode now - the big day is fast approaching; there are only 9 days until Moving Day. That gives me just about enough time to make sure I have cancelled everything I need to cancel here, and to finish packing. I'll also try to squeeze in as many typically English activities as possible - a trip to a pub, a meal at an Indian restaurant, some good old British TV, and completing a jigsaw puzzle. Hey, I didn't say they were exciting activities. So how am I feeling about the big move? Well, it's mixed emotions really. I'm excited at the thought of a fresh start - a new country, a new job, a new life. The idea of venturing into the unknown reminds me of when I left the UK to travel around Australia in 2004, although the difference then was that I knew I would be coming back. Of course I am really going to miss everyone here - my parents, my brothers and sister and their respective partners, the rest of my family and my friends... People who have made me what I am with their love and support over the years, and who all have a special place in my heart. I try not to dwell on the things I will miss - thinking of those things will only increase my angst about leaving - instead I prefer to concentrate on what my new life will bring me: fresher air, a higher salary, more security, lots of cheese and chocolate, and most importantly, the start of my married life with Christelle. Put all that together and it sounds like I'm making the right decision. I guess only time will tell, but I'm going out there to give it my best shot. I'm sure I will learn a great deal through living in Switzerland, and I promise to write regular updates to let everyone know how I'm getting on, as well as uploading photos to depict what Swiss life is really like. My aim is for this blog to help out other people in the UK (or any other country) who might be thinking about a move to Switzerland, as I might be able to give them the information they need to make an informed decision. If I only help one person, then it will all have been worthwhile. Well, that's it for now - there will be more articles added before Moving Day as I want to be as honest as possible with my thoughts and feelings, and these will no doubt be coming thick and fast in the build up to the 3rd October. I wish you the very best of luck and a following wind for 3rd October - you're going to need it in that car. Do they have jehovah's witnesses in Swissland? You could do that thing you did that time when we were younger when they came round the back door?! hehe that was funny! See some very similar aspects in your blog to my blog, we both departed our homes for totally new ways of life in new countries. Its a brave step, but one probably does not realise how brave until told by others later in life. Going to be a good read i think.